Andy Nelson paid a visit to the new Recreation Center at Hilltop for a feature article in The Star's JOCO 913 section. In 2008 the Blue Valley Recreation District began work on a strategic plan for future growth. One of the first steps in the process was to survey its target audience — people who live within the Blue Valley School District boundaries — to gauge their priorities. District residents already had many services thanks to Blue Valley Rec, which works closely with the school district. Blue Valley Rec's Activity Center, on West 151st, has a pool and gymnastics facility and offers enrichment classes. The outdoor Sports Complex, on West 137th, is home to baseball, softball, kickball and sand volleyball leagues and plays host to camps, clinics, tournaments and other activities. But there was still something missing, residents told district commissioners and staff. And a new facility, Recreation Center at Hilltop, is filling the community's needs. 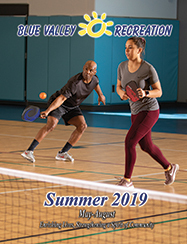 "The most frequently mentioned item throughout the community input process was the need for facilities and indoor recreation space," said Steve Baysinger, Blue Valley Rec's executive director. "More gymnasium space or multi-purpose indoor community space, an indoor walking track, indoor sports, fitness." When the strategic plan was refreshed in 2014, the goal remained clear, Baysinger said: Create a facility that filled in those gaps. Fortunately, the school district also had that goal in mind when it bought the 51-acre former home of First Family Church on West 143rd Street just east of 69 Highway. First on the agenda for the Hilltop campus, as it is known, were a district training facility and a childhood development center. The latest addition, is the 105,000-square-foot Recreation Center at Hilltop, opened Jan. 2. "I really commend the school district," Baysinger said. "They've always had the approach that education doesn't stop at 3:30." The first floor of the two-floor facility, which was designed by Westwood-based PGAV Architects and built by the Lenexa division of MW Builders, features four basketball/volleyball "pods." Each pod can be configured to hold two junior high-sized basketball courts, one full-sized basketball court or two volleyball courts. Both the basketball goals and volleyball nets are attached to the ceiling and can be lifted up when the others are in use. The courts host both league play and open-gym hours. The first floor also has space for pickleball. On the second floor is a one-seventh mile track that Baysinger said is one of the longest in the region. Large windows on three of the four sides give walkers and runners views from the aptly named "hilltop." Also on the upper level is a fitness facility with cardiovascular machines and free weights in the middle, machine weights on the perimeter, and rooms for fitness classes. The center also has a dance studio, locker rooms, classrooms and a meeting room, with a concession stand available for rental. The main goal of the center was to meet the need for court space, given the soaring interest in the district's youth basketball and volleyball programs, said Commission Chair Kathy Woodward. The idea behind the second floor was to give parents something to do while their kids practiced. The track and fitness center have long outgrown that "second class" status. Woodward's husband, Phil, is a prime example. He hadn't worked out in 20 years; now he goes to the center every day. "It's amazing how many people didn't know this was even going up, and now they've all joined," Woodward said. "People tell me they like it better than a typical fitness center. We didn't anticipate this excitement." Among the enthusiastic newcomers to pickleball at the center is Al Hanna, the former superintendent of Blue Valley Schools. Hanna, who is retired, played a central role in the creation of the Hilltop campus. "It represents the growth we've seen in the area," said Hanna, who also uses the track and fitness room. "It's a pretty rare day where I go there and don't reconnect with people, some from when I was the high school band director. Back when there was just one high school." As it nears the end of several months of use, the center has earned rave reviews, Baysinger said — and notched more than 5,800 memberships. "Everything's been very positive. Looking at how our society promotes health and fitness, and being more active, this is one piece of the pie that offers people multiple choices." Where: 7720 W. 143rd St. Cost: Monthly memberships to the center range from $19-$46 for district residents and $23$58 for non- residents. Annual memberships range from $200-$500 for residents and $250-$625 for non-residents. Day passes are also available. Read the article as it appears on the JOCO 913 website.